I really poured the water on this paper and ended up with something that resembles blotter paper. Now remember blotter paper is absorbent so the pigment would sink down into the fibers and spread out so things were not going my way. I made a batch of sizing from starch and painted several layers onto the front and back of the painting. Because the pigment was into the weave of the paper none came off. 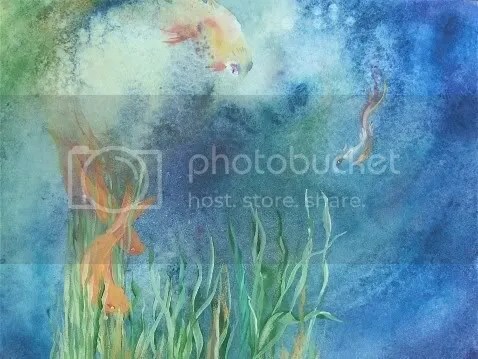 The I proceeded to paint in the weeds with Acrylic and watercolor combinations. I like the result and will usually try to save a painting. My style of painting uses a lot of water but this paper was not as absorbent as what I usually use and it really wasn’t sized well. So sometimes this happens, and you’ll find the watercolor isn’t sitting on top of the paper but sinking in. This doesn’t look good and is difficult to control. I used starch to bring the sizing back, it will never be as good as new paper but it does help. I ran out of time today, Whew, and here it is 8:30. 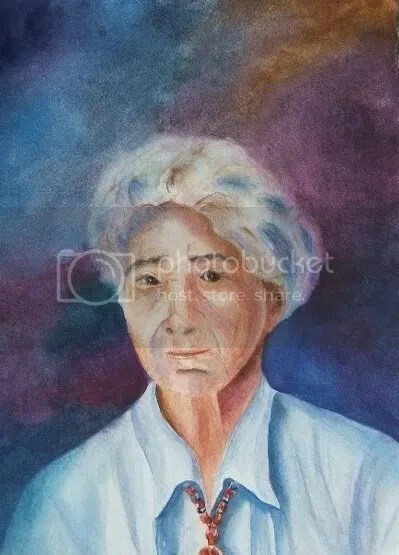 I’m just now posting my painting. I will most likely put a few more glazes over the sky and water and pump up the values just a bit. 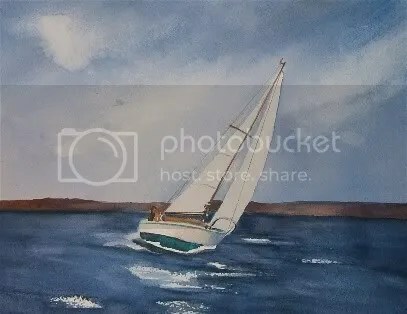 I thought I would paint a few sailboats. Its spring and I have seen several on the lake. Here on Lake Wylie its all about pleasure boats and Bass fishing boats. In the spring when its windy, The sail boats come out and I love to see them. I had some email from a gentleman who noticed I never put people in my paintings and I thought it was odd that he would want a painting with people in it. 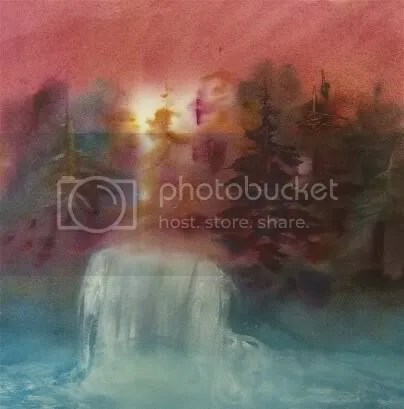 I guess its how you see the painting. I see it as if I’m looking at it thru a window or a camera lens. My perspective is to enjoy the natural setting without man’s intrusion. I love the scenes without people because I’m not much of a people person. I like things unspoiled and as they were before condos and high rises were built over every square inch. When I think of a wonderful scene I never think of it with people. i just see the trees, mountains lakes or whatever. This is another reason I don’t paint many city scenes. Not that I don’t enjoy them, but I live in an area that is near a lake and is wooded. That tends to be my inspiration. 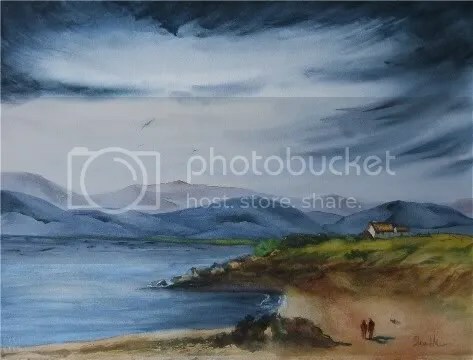 I only paint beaches once in awhile even thought I get many requests for them. I paint what I know and love. I put a small dog in this scene because if your going to go for a walk you should always bring your best friend. 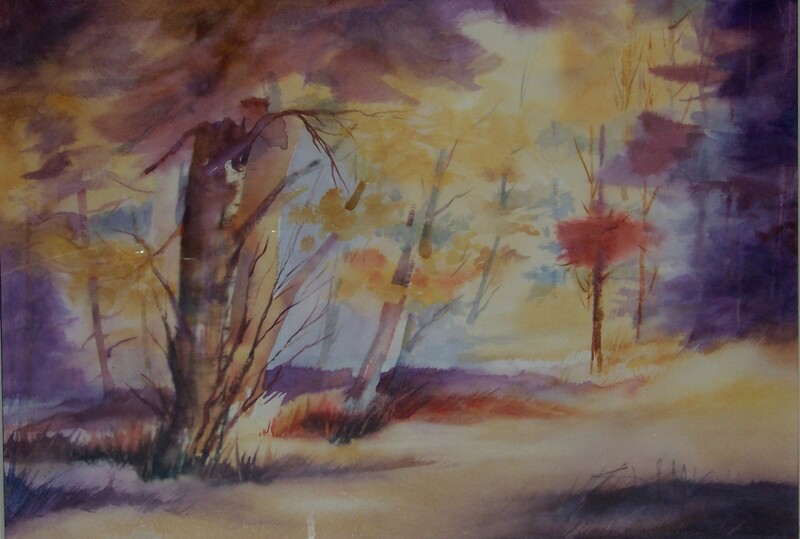 This painting is 11 by 15 and is for sale for 250.00 It was part of my woodlands series, I thought I would put it up for today. Today I wasn’t able to paint, I spent the day in the emergency room with my brother. He’s OK but he has to have an operation. What he though of as food poisoning turned out to be a Hernia. Apparently he has had it for a while but it became worse and when the pain became so great, he called me to drive him to the hospital. 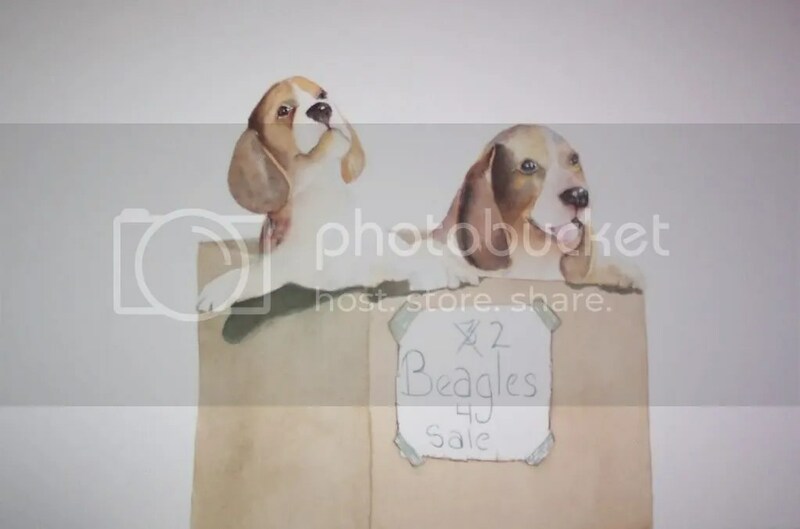 Size is 11 by 15… price is $300.00, Two beagle pups in a cardboard box for sale. Great faces on these guys… I love their expressions! This was a bit of an experiment, I used compliments and wanted to see if I could get some variation and wanted to try a technique I had heard about. After a bit I added a third color and then another & finally some white. It actually wasn’t a waterfall at first, then at the end I decided it needed something right down the middle. This might be the only painting I have painted using white out of the 226 dailies I have painted thus far.